I have been wanting to try yerba mate for a couple years now. I actually saw this product at my local Meijer and was contacted by the company the same day asking if I wanted to try it! 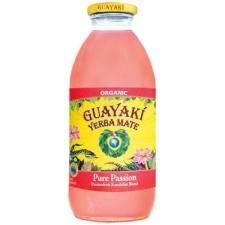 For my review, I was sent the organic yerba mate and the pure empower mint from Guayaki. Guayaki is a company that is organic and sustainable. To be honest, I was not sure what to expect since I had never tried yerba mate before. Here is some information on what yerba mate actually is: "yerba mate, it’s a traditional tea-like leaf native to the South American rainforest revered for centuries as a powerful rejuvenator. Yerba mate has the strength of coffee, the health benefits of green tea and the euphoria of chocolate." I tried a cup of each on different days and loved them both. The yerba mate is slightly sweet and tastes very similar to green tea. The pure empower mint was very minty and fresh. I really enjoyed the mint tea with a little honey creamer in it. Here is some information about Guayaki: Guayaki, a sustainable yerba mate company, as they continue on an incredible mission to restore the endangered South American Atlantic Rainforest and create living-wage jobs for indigenous farmers. I really love both kinds of yerba mate that I reviewed and would definitely recommend it. It is about double the cost of typical tea but is also stronger which is nice. The company shipped the products quickly too. I would recommend these products to someone who loves tea and enjoys being part of a good cause.